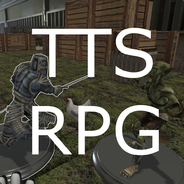 This is a simple group for players of Tabletop Simulator to find DMs and players looking to play an assortment of pen and paper and tabletop RPGs. Any RPG is welcome, whether a quick creation boardgame such as Descent or Mice and Mystics, or eleborate storyline rpgs such as D&D, Pathfinder, or V:tM. Don't be shy, express yourselves freely, and above all be polite. Events are open for creation, so if you wish to plan a game, feel free to post it there so others may view and be alerted as to when it begins. Hey everyone. Today is Tabletop Day, so get out there and host/join some rooms! Let's do everything we can to bolster the fun today! I'll be trying to get a couple Pathfinder modules going today, so keep an eye on the events as I get them set up. Thanks. I'm not against advertising other groups, as the main reason of this page was to provide a tool for group gathering. This discord group has 2700+ online D&D, etc. players, many of them on TTS. Very active. Due to inactivity, it was taken down, I'm afraid. can you sent me an invite for the discord group? is still up? looking for some games as a player and gm..